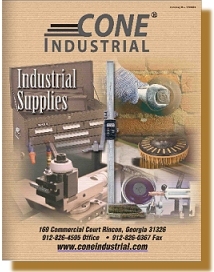 Cone Industrial has provided quality industrial supplies and outstanding service for the Southeast since 1976. It doesn't matter to us whether your business is large or small, our commitment to excellent customer service is the same. We offer many thousands of industrial supplies that businesses need. Some are common items, while others are hard-to-find specialty products. Because of our volume and our ability to work with our suppliers, we are able to provide our customers with the quality products they want, at a price they need. Our vast array of products allows our customers the opportunity to save time and money by enhancing their purchasing power through supplier consolidation. Now you can save time and have added convenience by shopping with our online catalog. Simply click on the "Products" link at the top or bottom of this page or on the picture of the catalog to the right to find the industrial products that you need. When you find the supplies that you need, you can even purchase them online by adding them to your virtual shopping cart and then going through the checkout procedure just like you would in a conventional store. Copyright © 2008-2009 by InterWeb Designs, Inc. All rights reserved.